Enjoy fresh, uplifting music for a variety of liturgical uses from creative duo Mark Friedman and Janet Vogt. This 13-song CD from Mark Friedman and Janet Vogt features songs for a variety of liturgical uses including praise, reconciliation, healing, gathering, acclamations, Eucharistic hymns, closing songs and seasonal pieces. 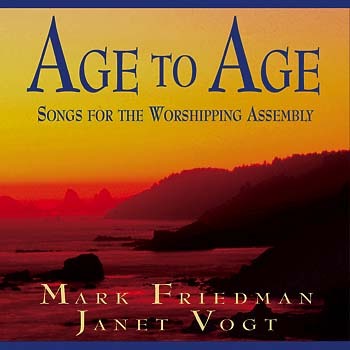 This 13-song MP3 album from Mark Friedman and Janet Vogt features songs for a variety of liturgical uses including praise, reconciliation, healing, gathering, acclamations, Eucharistic hymns, closing songs and seasonal pieces. Age to Age is appealing listening to anyone who likes beautiful, spiritually illuminating music. It is also a great, self-contained resource for any parish music director seeking an inspired liturgy. This fresh, uplifting music is composed for a variety of liturgical uses including praise, reconciliation, healing, gathering, acclamations, Eucharistic hymns, closing songs and seasonal pieces. Lively and joyful, “Sing Alleluia” engages the assembly with its rhythmic and singable melody and is great as a gathering or closing song. “Rise Up with Him” is a song of hope in the powerful resurrection of Jesus. With its uplifting gospel feel, it is ideal as a closing song for the Easter season or during Ordinary Time when the liturgy calls for themes of resurrection. The songs and hymns on Age to Age are flexible enough to be sung by either an average congregation or an experienced SATB choir. The recording features solo cantors and a full choir with varied instrumentation that's easily adapted to the unique talents of any parish. String arrangements are available in manuscript form.